This page contains more in-depth explanation of how to interpret the aberration catalog components, and the terminology found on the site. It is necessary to read this section to understand what the Society and the articles are talking about. Aberration / Aberrant — Simply put, these are creatures or objects that don’t act normally. In the context of the Society this means they (most of the time) exhibit anomalous and unnatural properties. What constitutes an Aberration or a normal animal is a hot debate, though it's accepted that Aberrations are things not accepted by mainstream science. Warders — The backbone of the Society. These are the footsoldiers that catch your run-of-the-mill aberrant. Usually you will see these type of units hunting White to Orange severity aberrants. Often times, Warders will opt to live off the grid and use code names, but this is not always the case. Outfit — A group of Warders who have banded together to hunt an aberrant. These groups are in charge of keeping aberrants in their localized areas in check. Specialized outfits could potentially be constantly traveling as reports of sightings or requests are given to them on a daily basis. Red Ryder — An inexperienced Warder. This is a Warder who thinks they can go out with a Red Ryder BB gun and hunt down Big Foot with it. Rangers — An experienced and seasoned Warder who has shown themself to be a master at accomplishing the Society’s will. Usually you will see these units being the leader of large outfits and hunting red to black severity aberrants. Norman — A term of endearment by some and loathing by others, Normans are the colloquial Society nickname for those who lack the knowledge of the supernatural and paranormal. "Normal" Norman knows little to nothing about how things really work out in the woods. Data Collection Center — These are the places which, eponymously, collect data. The articles you read are usually compiled in these places as they distribute information on aberrations. At times, they may pass along bounties for killing or collecting aberrations, usually from the Bureau or for private study from Society members. As soon as a successful hunt is accomplished the logs for that hunt is incorporated into an article. This creates the potential for varied logs and the ongoing development of tactics. The Great Circle — These members make up the highest echelons of the Society. While all Warders have access to almost all information of the things they hunt or procure, these top-ranking members have access to articles and information currently forbidden for regular viewing due to their implications. Members at this standing display a level of skill and valor that sets them apart from the regular Ranger. They have been described as ominous and very secretive, keeping even their code names unknown to the regular Warder, instead opting to use generic names. They are also collectively considered to be the “leaders” of the Society and coordinate all of the Data Collection Centers. The current mechanisms for selecting new members of this group are kept a secret and seemingly happen at random. The Bureau — A term for the paranormal-oriented agencies1 of the United States and Canadian government that assists the Society once in a while. Like the Society, these agencies are secretive and perhaps even deal with other organizations separate from the Wayward Society. Often times these groups will use their governmental influence to help the Society stay under the radar, provide the Society with information on potential aberrants, and even partially fund projects essential to the execution of the Wayward mission. However, this alliance can only be described as shaky at best. Fringe — Fringes are outsider organizations or factions. Sometimes used to refer to rogue groups within Warder society or even larger organizations that are not aligned with Warders. The original and official seal of the Wayward Society. The Society, as an official organization, began somewhere in the 19th (possibly 18th) century by a group of monster hunters, spiritual cleansers, and relic collectors whose number is currently agreed to be around fourteen. They established themselves in the United States of America, traveled around the country, and maybe the globe at times to protect humanity from malicious forces. This group would call themselves “The Great Circle”. The organization at that time was not well documented, so take any speculation about the true nature of the Society’s origins with a pinch of salt. The founder of the Society, Nathaniel Ingram, collected around thirteen other colleagues of monster hunters and relic collectors to found “The Great Circle”. After the death of a couple of the senior members of this group Nathaniel Ingram realized the work they tried to accomplish would take generations, and hence he established the Wayward Society with The Great Circle as the administrating body. In Nathaniel Ingram’s travels around the country, he eventually heard of a truly terrifying beast. There is very little documentation about this encounter, but it is known that the beast had terminated many aberrants and Warders alike. Not much is known about the properties of this particular aberrant, but by the end of the bloodshed, it too had taken the life of Nathaniel. What happened to the aberrant after that is unknown, but it is believed currently that The Great Circle currently has it restrained, somehow. This knowledge is hidden except only to the few members of the Great Circle. The Society has a long and rich history with a diverse range of hunters, relic collectors, spiritual cleansers, and much more who have heeded the call to destroy, banish, and keep at bay malicious entities. To help them accomplish this goal, they will sometimes employ the use of tamed aberrations, benevolent entities, and select artifacts. The main Society is based in North America, however the Society has set roots all around the world in other countries.. And although it was created with the intention of protecting the US settlers in the 18th century, countries from all over North America have joined with the Wayward Society in its pursuit of the protection of humanity. 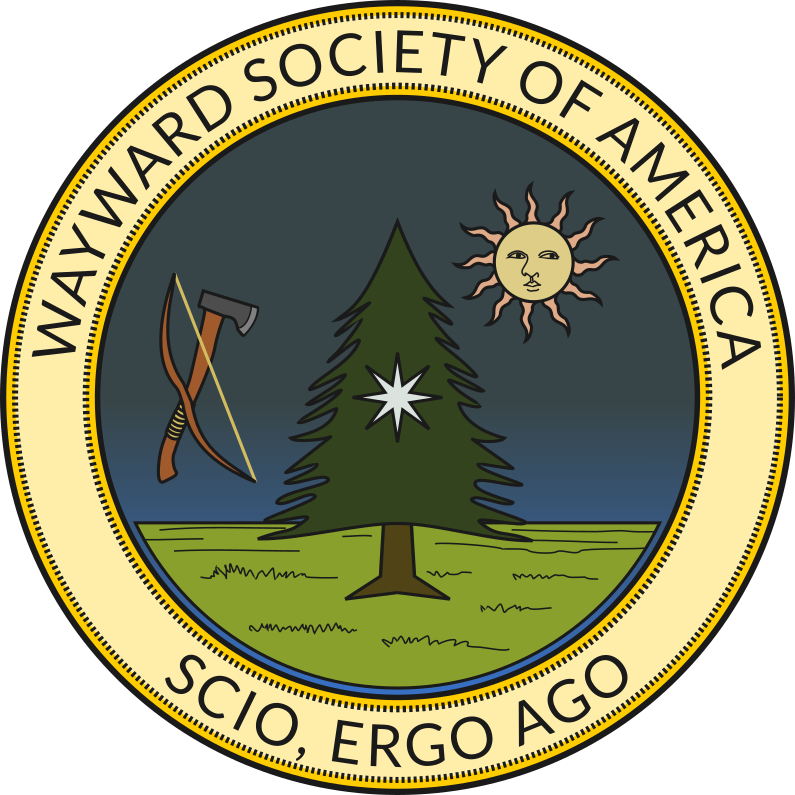 The Seal of the Wayward Society is simply a nod to the origins of the Society. Though founder Ingram's legacy has continued on, the number of Warders recruited has been low, and the Society is attempting to establish incognito programs to recruit potential candidates. By discovering us, you have been already been selected. Information that will aid you in your participation in the Society is documented here. Every aberration is assigned a category designation within the Society. As more aberrations were being discovered and cataloged a new way of differentiating the types were needed. The five categories: Cryptid, Artifact, Metaph, Spectre, and Evergreen accomplishes this. There was no standard format of categorization before the Wayward Society Catalogs were established. These categories have now recently become the standard for most of the Society. Follow them when cataloging the Society’s knowledge on the spirits, beasts, and relics it encounters. Cryptid-type aberrations are entities with physical forms. Aberrrations of this type don’t necessarily have to exhibit any “magical” or anomalous properties, but some do. A lot of urban legends such as El Chupacabra, Moth Man, and the Jersey Devil would be classified as this type of aberrant. Even more so, a Cryptid covers physical beasts, plants, microbes, fungi, or most creatures that have a form in the physical world. A virus could even be placed in this category. These aberrations are defined as (most of the time) inanimate objects that have some sort of special property. In some cases, they can also be a particular zone or area of land. An example of what would be an artifact would be the Holy Grail or Moses’ staff. Physical but inorganic things go into this category. Note that it is completely possible for an artifact to be animate but not alive in the traditional sense. These aberrations are defined as non-physical, non-human entities. A Metaph's existence is metaphysical in nature, but they can manifest in the real world. Often times rituals are used to deal with these types of aberrations, or the destruction of any objects that they may be tied to. Examples of what would be considered a Metaph are divine deities, angels, demons, and nature spirits. Unexplained phenomena that manifests in the physical world can also be categorized as Metaphs. Many mythological creatures and figures would be considered Metaphs. Metaphs can commonly possess other creatures or objects, but are still categorized as a Metaph. A Spectre is defined as an aberration who once existed in the physical sense, but now only exists an echo of their former selves. Often times these entities are anchored to objects or places, but can be conjured in rituals. Each particular Spectre has their own behavior and properties. Usually these incorporeal entities are contained, banished, or appeased. Often times some Spectres require multiple expulsions or methods of appeasement until a certain condition is met to fully be rid of it. These types of aberrants are a special category, meant for creatures that exist only physically but display extremely abnormal properties related to eternal life, that are not understood. Evergreens are aberrations that defy all natural laws to continue their existence. These abnormal properties can be defined as immortality, reincarnation, or complete invulnerability to certain effects, among others. Evergreens are especially used as a catch-all for more misunderstood entities (usually Cryptids) that may not fit in any other category due to their nature of opposing death. An example of Evergreen is the Phoenix (which may qualify as a Cryptid, but its property of immortality through immolation qualifies it for the Evergreen category). The pop culture entity, Dracula, is considered an Evergreen due to his abilities of supernatural immortality. Every aberration is assigned a Threat Level within the Society. The tradition of Threat Levels were mentioned in the various Wayward encyclopedias published in the 19th century, albeit unofficially within Society standards. The unofficial categories utilized a variety of color schema to denote the dangers of an aberration. Only recently has the Society has codified a Threat Level used by all official Society Members. Follow these guidelines when adding a new entry into the catalog. A designation marker on White means the aberration can be easily controlled or destroyed. Poses a non-existent to low threat to Warders or Norman. A Blue designation means the anomaly proves harder to control than white threats, and has caused or can cause a low number of deaths or minor injuries to The Wayward Society or Norman. Poses low to moderate threat for Warders and Norman. Orange advises care when handling aberrations of this designation. The aberration has caused or can cause multiple deaths or major injuries among The Wayward Society or Norman, and needs an experienced outfit to be controlled or destroyed. Poses a moderate to high threat to Warders and Norman. A Red threat level indicates the aberration has caused or can cause a severe number of deaths. It can also cause mass panic among Norman society if its existence is revealed. Should be controlled/destroyed as soon as possible by two or more medium sized, experienced outfits. Poses high to extreme threat for Warders and Norman. An aberration assigned Black threat level has caused or can cause complete devastation of entire ecosystems, or destruction over a large scale area. It can also account for a powerful aberration that is best left dormant or unbothered, or perhaps one that is too powerful to be stopped under normal circumstamces. It should be controlled or destroyed immediately by large-scale experienced outfits, and could warrant the attention of the Great Circle. Poses an extreme threat to Warders, Norman, and ecosystems. When looking for the current status of an aberrant, it might be a little hard to ascertain that information from the article itself. These will clarify the status of a particular aberrant and are the evaluations of the Data Collection Center in charge of the article. Note that these may not be accurate in all cases due to aspects of an aberrant which may not have been documented yet. This aberrant is alive and well. It is very active, and the Society has noticed. This aberrant is most likely active, but it is unknown how active it is or where it might be currently. The aberrant is active, but it isn’t going to do humanity any harm or be noticed by regular people due to either its inherent nature or the fact that the Society is keeping it in check. Inanimate artifacts usually go in this category. The aberrant is killed, no longer active, or has been harmed to the point where it will never show signs of activity again. 1. Other non-English speaking countries in North America may have their own specialized departments that have their own names used by local Warders.